(CHRIS) This morning, the 23rd, we went to the mission. There Jon and Matt went to confession, I can't figure out why. Sam kept his clean-cut image by shaving at Chevron. Then we went to a neat little beach and threw the frisbee for an hour. Then we began our search for Sylvester again. We finally found him 1 minute before show time. I treated the guys to the movie--Cliffhanger--because for some reason I promised them I would a while back. It was an awesome and very action-packed movie. There was alot of cusswords but no other garbage. We all liked it very much and all rejoiced. After the show, we went to the Santa Cruz boardwalk. We found out later that the Lost Boys was filmed here. There were lots of rides and games and arcades, but we just looked. The beach was kind of crowded, but not packed. The waves were pretty good. We played some frisbee and had some nice diving catches. Jon sat on the beach and wrote to his girl. There were many body surfers but no real surfers yet. 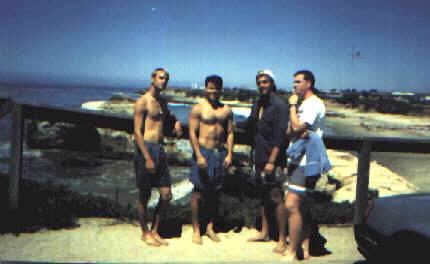 After the beach we saw some surf shops and went to the only beach shower around, a mile up the coast at the lighthouse. After showering, we watched the real surfers for awhile. There was even a huge surfer statue there. The waves weren't too big but there were alot of surfers out there. The whole time Matt fantasized that he was one of them. He almost even bought a board for $60. We got some TV dinners and pasta salad and played with their vegetarian dog while Lillie's mom told us about big waves and scuba diving. It was all so Californiaish. We were thrilled. Lillie as very enthusiastic about showing us around and didn't care how late we stayed out even though she would work the next day. So we asked her to show us San Francisco. She said "sure" and even drove us. In fact, she drove us very fast (also Californiaish). We had a great time with Lillie. She was easy going and alot of fun. We saw the Golden Gate, Lombard Street, Pier 39, and alot of the city in-between. Then we went to a coffee shop--so Californiaish--in downtown. Very nice atmosphere but the boys weren't too impressed with the Espresso. I ate cake. We had a good time there and Lillie laughed at all our jokes. None of us really knew her before that day (except Sam), but by the end of the night, it felt like we were old friends. She said that it was the best time she ever had in S.F. because we were all so easy going and... well, I don't know, but she liked us and it boosted our egos. It was fun. (Nice girl--she'll help you find the answers, George!) At her house, we slept on the porch for the house was already full of foster kids. We hit the hay at about 3.